"A self balancing, two-wheeled, inverted pendulum robot." The early popularization of personal transportation with portable hoverboards has inspired and paralleled the recent development in hands-free transportation systems such as self balancing scooters. Further, advances in Artificial Intelligence and Robotics has forwarded the creation of surprisingly capable robots that can navigate the world autonomously. These technologies are made possible by research in dynamic control systems, that has recently produced amazing results. Such research and technologies have inspired us to create our own self-balancing robot. In this report we present the design, construction, results, and concluding thoughts that have culminated in our final project for the course ECE 4760: Designing with Microcontrollers, a PIC32 operated self balancing robot. The robot, or balancebot, consists of a tower structure that houses the PIC32 with peripherals, an inertial measurement unit, and a motorized drive system. The PIC32 receives tilt information from a gyroscope and accelerometer and produces a pulse-width modulated directional signal to drive two motors sitting at the base of the tower. The motors drive wheels that position the robot so as to counteract the tilt of the tower and thus balance the structure. 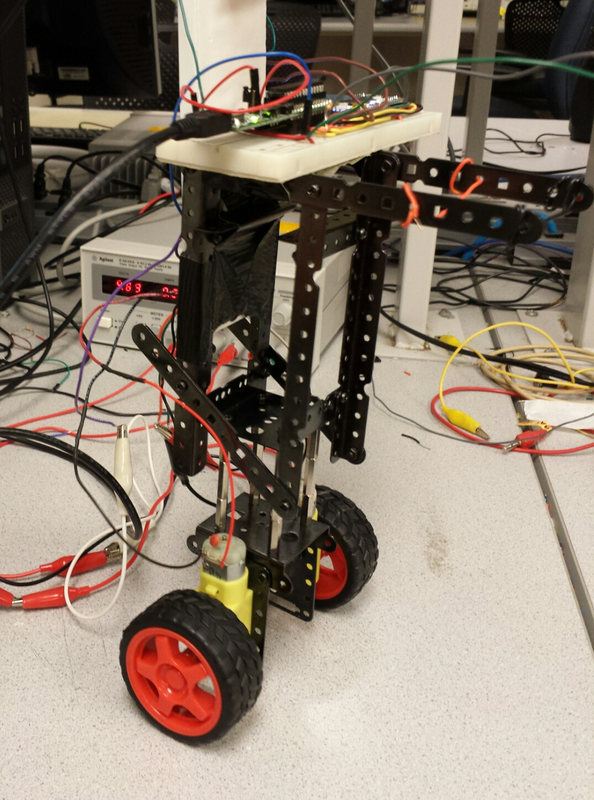 The chassis, motors, and wheels were salvaged from an Arduino robotics kit. We bought gyroscope and accelerometer chips as well as an H Bridge. All other components were sourced from the ECE 4760 lab space.